Moles are exceedingly common. Most of us have moles of some description. Depending on the location and characteristics of these moles, removal may be considered for physical discomfort or for cosmetic reasons. At our specialist Mole Clinic, you will be assessed by our team of Consultant Plastic Surgeon or Consultant Dermatologist who will advise you of the best mode of treatment. The treatments we offer include surgical excision, shaving and laser ablation. If necessary, the mole can be sent for histological examination. 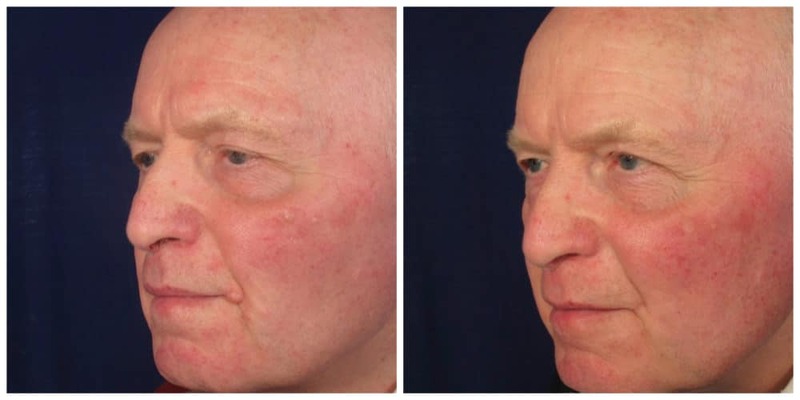 This procedure is carried out using a CO2 laser under local anaesthesia. It is hence painless after the initial local anaesthetic injection. The laser essentially vaporises the mole, leaving behind a shallow crater which will heal over 1-2 weeks depending on the location. 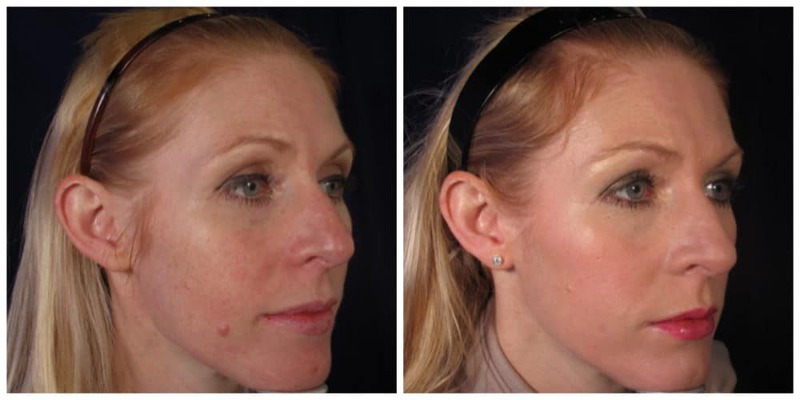 This technique is particularly useful for multiple moles or other benign lesions on the face or the body. £640 for the first mole and £200 for each subsequent lesion. Larger moles (more than 2cm) will attract an additional charge of £100 each. If histology is required, this is £130 for each mole. The local anaesthetic will wear off approximately 1 hour after the procedure. Paracetamol can be taken once the local anaesthetic has worn off. If the surgery was to the head, sleep with the head slightly elevated on a few pillows for the first week and avoid bending with the head down. No restrictions but avoid strenuous activities for the first week. The wound can be very gently washed and then pat dry. "I would just like to say thank you to you and your team. You were very kind and I appreciate it very much..."
"Thank you very much for removing the mole off my forehead. I am so grateful that it is now gone after all these years..."
How much does mole removal cost? We have a team of plastic surgeons who are very experienced in surgical mole removal. Consultation, treatment and 2 follow up appointments at 1 and 3 weeks. Subject to the surgeon who treats you, our prices start from £640 for the removal of the 1st lesion and £200 for every lesion after that. For lesions that are larger than 2 cm, the fee will increase by £100 and a maximum of 4 lesions can be removed at one time. If a histology report is also required the charge for this is £130. In order to book treatment, a deposit of £200 is required. What treatment options available for mole removal? having your mole is a simple and painless procedure you may wish to choose if your mole sticks out from your skin. During this treatment, our plastic surgeon will apply a local anaesthetic and simply shave the protruding part of the mole down until it is level with your skin. The area will then be cauterized with an electrical instrument to prevent bleeding, and we reduce the risk of infection using a topical antibiotic. You may have a pink mark in the mole’s place but don’t worry, this will fade in time. An excision treatment for mole removal is slightly more involved but is still performed under just a local anaesthetic. Our expert plastic surgeon will surgically remove the mole and a perimeter of healthy skin which surrounds it. To complete the procedure we will stitch the wound, either deep in the skin or on the upper surface as appropriate. There will be a small scar, but this will gradually become less visible. Your skin will heal as normal after a mole is removed. However, if the mole were to return, you should book another appointment with us as soon as possible as this would indicate the presence of a type of skin cancer called melanoma. What is covered in the consultation for mole removal? You will see a specialist plastic surgeon during a mole removal consultation at Kat & Co. They will have years of experience in checking and, where required, removing moles. We’ll thoroughly check your moles and provide expert advice as to how mole removal should be carried out if it’s required. This will be based on the size and shape of your mole. Please note that mole removal should only be carried out by a specialist plastic surgeon. If you have any other questions that are not naturally covered during the consultation, this is also your chance to ask them. We send some lesions, as well as pigmented moles, to a specialist lab for medical histology analysis. This is to provide the highest level of service and protection to you, and you’ll be made aware of the additional charges for this if applicable. How frequently should I get my moles checked? If you are in a high-risk group for melanoma, we would recommend making a mole check and mole map consultation with us every six months to a year. If you are not high risk and your mole coverage is within the normal range for an adult of 10-40 moles, then a check with a dermatologist is normally only necessary if you have a specific concern or have noticed changes to your moles. It can be a good idea to ask a partner or friend to check your moles from time to time, as they may be better able to observe changes that you want to check out with a dermatologist. Is it natural for new moles develop on an adult? New moles do develop on adults and, in fact, your total mole quantities peak during your teens or 20s. By the age of 30, it is less usual for people to develop new moles regularly. So if you get a new mole after age 35 it is a good idea to keep an eye on it and get it medically evaluated. This may include a biopsy. This is because a new mole at this age could indicate early melanoma or an evolving abnormal mole. Do get such a mole evaluated by a dermatologist. Bear in mind that it is not unusual for non-mole growths to appear on adults. These are known as mole simulators and there are many varieties including pigmented basal cell cancers, skin tags, café au lait macules, neurofibromas, melanomas, hemangiomas, seborrheic keratoses, lentigines, freckles and liver spots. To an untrained eye, they can be hard to identify, so it is worth booking a consultation with a dermatologist. Is it safe to shave my own mole? It is not safe to shave a mole at home and you should never try to do so. This is because you could get an infection, permanently disfigure yourself or create a cancer risk. Always work with a specialist medical professional if you wish to remove a mole. Which health conditions are related to moles? Most moles do not pose a threat. However, the most common health condition relating to moles is the potentially deadly type of skin cancer known as melanoma. If it is identified early, melanoma can be effectively treated and cured. But if left unchecked, it can be fatal. Self-checking your own moles (perhaps with the help of a friend or partner) can help you to identify melanoma early. We advise regularly checking your skin for moles, particularly those parts exposed to the sun. Use a mirror or someone you feel comfortable with to get full body coverage. In particular, look for changes in a mole’s shape, height, colour size, any discharge (including bleeding), or if it becomes painful, tender or itches. For young women, melanoma is the most common type of cancer and is most often found on the lower leg. In men, it is more likely to be found on the chest or back. Particularly look out for moles that differ from others on your body, or that appear for the first time after you turn 25. Here is a useful ABCDE guide for assessing a mole yourself. If any of the following characteristics are present, speak to a dermatologist as soon as possible, as it could be a sign of cancer. 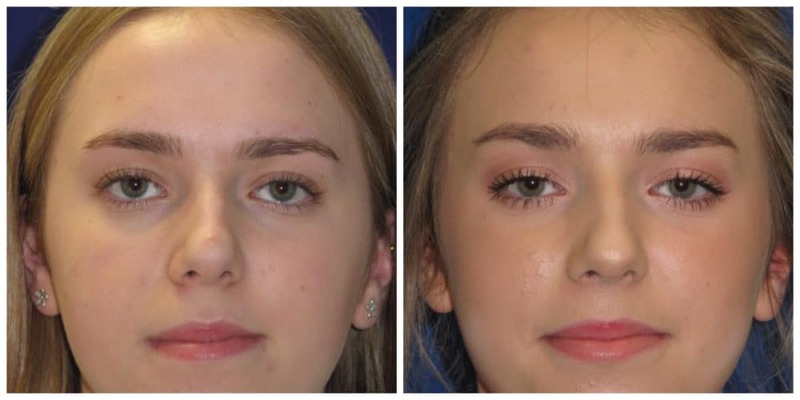 Asymmetry– The two halves of your mole do not match. Border – There is an irregular, ragged or blurred edge to your mole. Colour – There is not a consistent colour to your mole or it contains shades of red, white, blue, black, brown or tan. Diameter – The width of your mole is wider than the rubber on a pencil. Evolution– The colour, shape or size of your mole is changing.